The Food Alphabet and More: The Big Summer Outlet Sale 2013! + Get FREE entrance tickets! The Big Summer Outlet Sale 2013! + Get FREE entrance tickets! The Big Summer Outlet Sale 2013! BPI credit card holders (with valid ID) get FREE entrance to this great shopping event, with additional discounts and raffle prizes (every hour) for BPI Edge cardholders with their purchases. For non-BPI credit card holders, you may opt to pay for the P50.00 entrance fee or apply for a BPI credit card at the event to gain entrance. But for those who are not really into credit cards, here is another option so you can step foot into this great event. Just share this post on your wall (click on the Share button on top of this post), leave your full name (real name) and your Facebook profile, on our comments section below starting now until 6 PM April 25, 2013 Philippine standard time, and you can get to bring along with you 5 of your friends to enjoy this great summer sale event. First come, first serve. The first 10 readers who shared this link, posts their name and Facebook profile gets 5 tickets each, for a total of 50 tickets which you can claim at the event itself anytime during the 3-day sale, please do bring your valid I.D. to confirm identity. I will send a message on your FB account on how you can gain entrance to the event. So what are you waiting for, comment away! See you at the SALE! 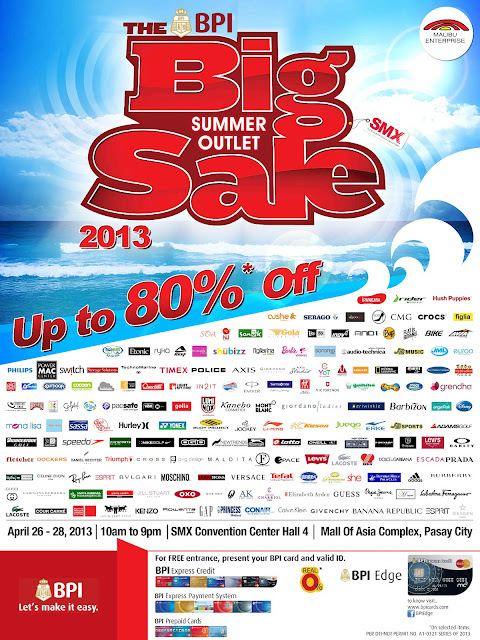 The Big Summer Outlet Sale 2013 is brought to us by Malibu Enterprise, BPI credit cards and The Food Alphabet and More! Thank you to our 7 commenters, who each got 5 tix to The Big Summer Outlet Sale at SMX Convention Center. Please see FB message that I will send to you for instructions. Thank you all for joining! Enjoy shopping! Here's the link of my fb account. Many thanks guys. :) God bless you. Hi Ralph. I did message you based on what you have indicated. I'm sorry though you were not able to receive the message and not being able to use your tix. I'll remember this and make this up to you next time.